You know it's the holidays when you've already been to a Christmas cookie exchange! Now to remember the cookies are for guests, not for me. Boy they're tempting though. 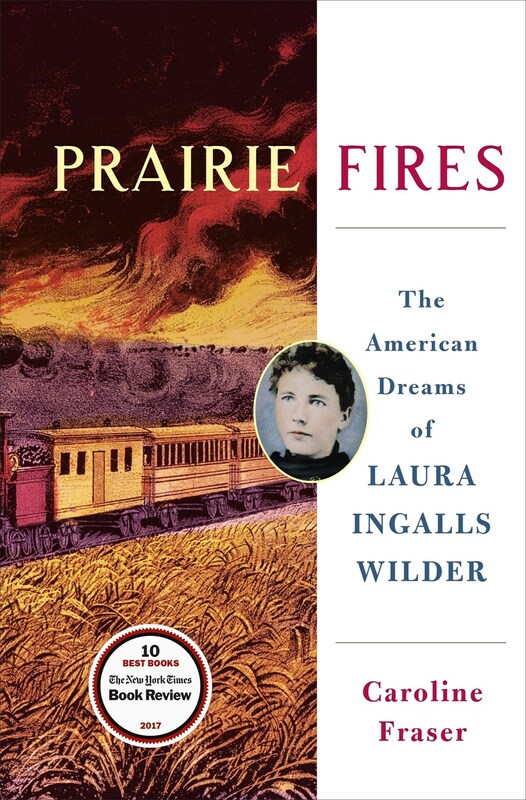 Prairie Fires: The American Dreams of Laura Ingalls Wilder by Caroline Fraser (Metropolitan Books): One of my favorite ways to read nonfiction, especially history and biography, is to combine print and audio, so that's the approach I took to this fascinating and eye-opening look at Wilder's life and work. The book starts with a factual account of Laura's childhood, which sometimes differs from the picture Wilder painted in her Little House series. What's new here aren't so much the generalities as the details, especially of some of the decisions Charles Ingalls (Pa) made, the family's financial situation, and Wilder's education and need to work. Next, Fraser looks at Wilder's adult life: as wife, mother, and author, especially in the Ozarks. Fraser delves into Wilder's marriage to Almanzo, the couple's relationship, his disabilities, and their struggles on their farm. Most surprising for me was learning more about Wilder's daughter, Rose. Rose had many financial and mental issues but still managed to become a well-known writer and world traveler. In addition, there is no doubt that Rose helped sell her mother's initial manuscript and also played a role in editing and polishing Wilder's work--though the stories, the charm, and perspective are all Laura's. The final section deals with Wilder's legacy. Throughout, Fraser puts Wilder's experiences, opinions, and literary work into the broader context of history and contemporary issues: American Indian relationships, civil rights, the Depression, the New Deal, communism, the romance of the West, and more. Note that Fraser doesn't hesitate to share the less endearing aspects of Wilder and her family; your opinions of the beloved Little House gang will likely be changed. 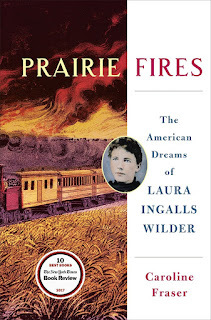 Prairie Fires is important both to fans of Laura Ingalls Wilder and the Little House books and to people interested in American history. It's hard to fully comprehend the expanse of Wilder's life: from a covered-wagon pioneer helping Pa clear sod to a world-famous author flying in a plane to visit her daughter. The unabridged audiobook (Recorded Books; 21 hr, 26 min) was read by Christina Moore. Moore's performance was engaging, and I was particularly impressed with how she handled the more sensitive material. My full audiobook review will be available through AudioFile magazine. 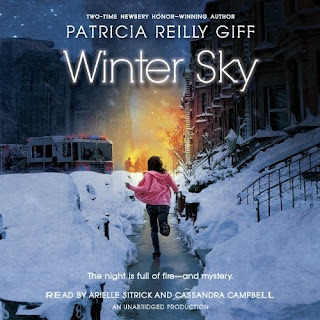 I also listened to a children's book: Winter Sky by Patricia Reilly Giff (Listening Library, 2 hr, 49 min) read mostly by Arielle Sitrick (Cassandra Campbell had a small part). Although Sitrick's rendition of the young girl's voice and perspective was very nicely done, it couldn't save this story of a young girl in New York City who worries about her firefighter father. Siria, named after her late-mother's favorite star, sneaks out at night to chase the sirens when her father is on duty. When Siria suspects there is an arsonist in the neighborhood, she decides to figure out who is doing the burning, almost destroying some her friendships along the way. So much of this story is unrealistic, from the fact that neither Siria's father nor her baby-sitters ever notice the youngster (I think she is around 10) climbs out her window or tiptoes out the door at night to the idea that the child of a firefighter would decide it was safe to investigate arson all on her own. I finished listening only because the book was short and got me through some of my holiday baking. Two audiobooks—-I’m always amazed at the volume of audiobook listening you accomplish. I haven't found an audiobook as yet with a narrator I want to continue listening to. I find the voice distracting sometimes. Prairie Fires looks really good. Thanks for sharing, and for visiting my blog. Have a great week. There seems to be a lot out about Laura Ingalls Wilder right now. I think I'd like Prairie Fires. Prairie Fires sounds good. I just got a fiction version of Rose's life as a Kindle deal that got added to my TBR mountain. I'm sorry that the Giff book was so unrealistic. Come see my week here. Happy reading! i wasnt ever into Little House TV or books ..
Prairie Fires looks very interesting, the Little House show was a big part of my childhood and I read a few of the books too, although I don't remember exactly which ones. I bet this book would be very eye- opening and fascinating! Both sound good! I do that, too - if I find out an audio book has photos or illustrations, I will get the paper book out of the library to look at alongside the audio! Prairie Fires is on my wishlist. Beyond the Bright Sea is an excellent audiobook if you're looking for something new. I'm getting ready for the new year. Come see what I'm looking forward to and what I'm reading now. I loved watching Little House when it was on, but have never read any of the books. I read all of the Little House books back in the early 70s, but never got into the TV show. Prairie Fires sounds like it would be good on audio.